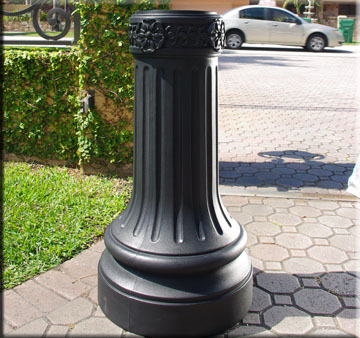 Polymer resin clam shell sleeves, wrap around bases, and protective light pole covers are an ideal solution for protecting or refurbishing steel, fiberglass, wood or aluminum street light poles. The inherent properties of polymer resin provide low maintenance and durability of industrial plastics. Light pole wrap around clam shell shrouds have molded through color. It will rust, chip or peel. Covering your poles with a durable linear low density polyethylene (LLDPE) clam shell light pole base or wrap around sleeve is a low cost viable alternative rather than painting or replacing poles. The LLDPE is the same reliable and proven material used to coat outdoor telephone cable. 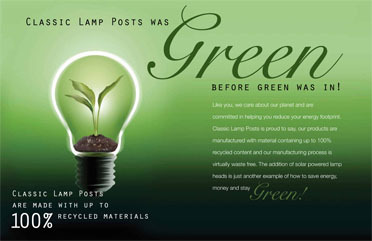 The durable Polyethylene sleeves, shrouds and protective covers are made with up to 100% recycled material. Virtually indestructible, the replacment covers are manufactured from commercial grade rotationally molded polymer resin, UV protected from sun light and inclement weather with molded through color which will not rust, peel or chip. 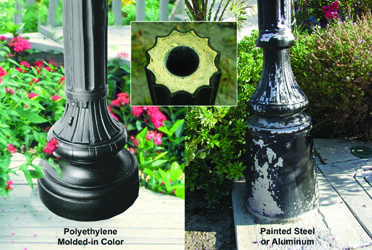 Clam shell decorative bases are the solution for protecting the pole base, restoring damaged bases, and adding a decorative look to plain poles. Just put both clam shell halves in place and join them with the supplied fasteners. Slip over bases provide an easy decorative solution for existing pole applicatons. Remove the fixture and slip the base over the top of the pole, letting it rest on the ground. 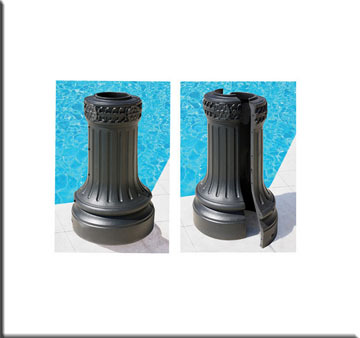 Polymer resin clam shell light pole covers are manufactured in America ensuring prompt delivery and good quality.